When you see treats like candy corn, apple cider, and pumpkin spice everything hitting the store shelves, you know fall isn’t too far away. 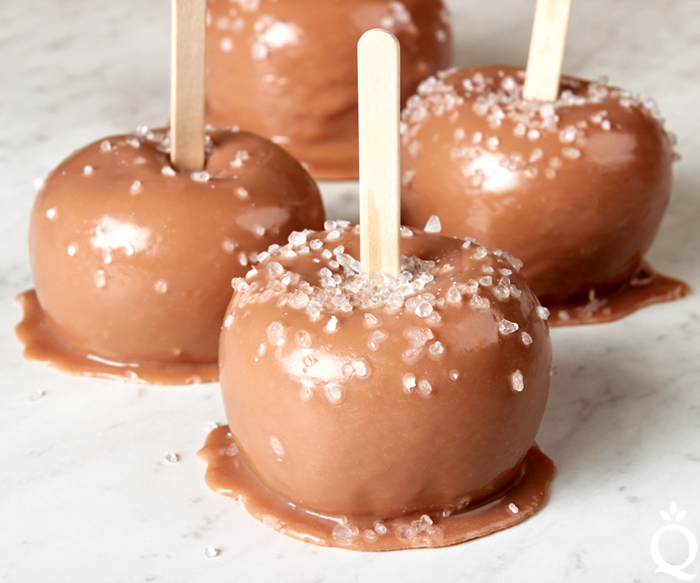 Caramel apples are another classic. Who doesn’t love the combination of creamy, sweet caramel and tart, crunchy apples? We certainly do, which is why we decided to recreate the look in soap. 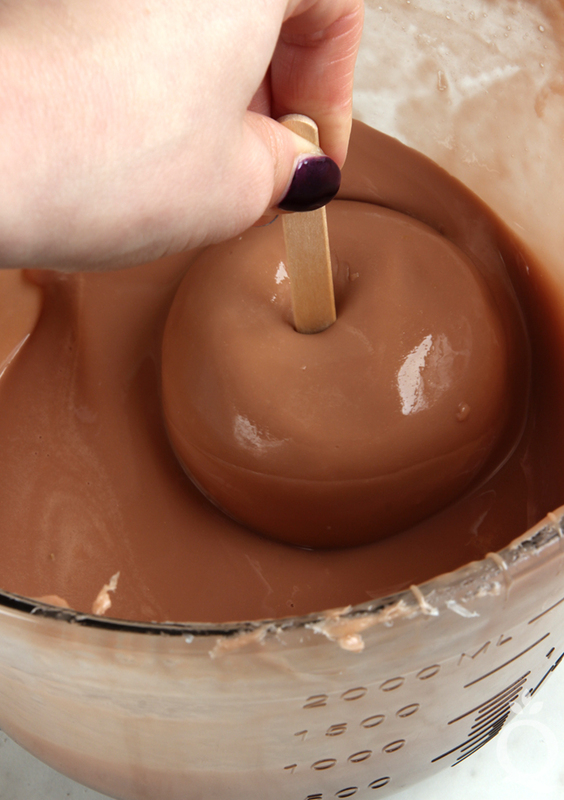 The original Caramel Apple Soap Tutorial was shared in 2011. 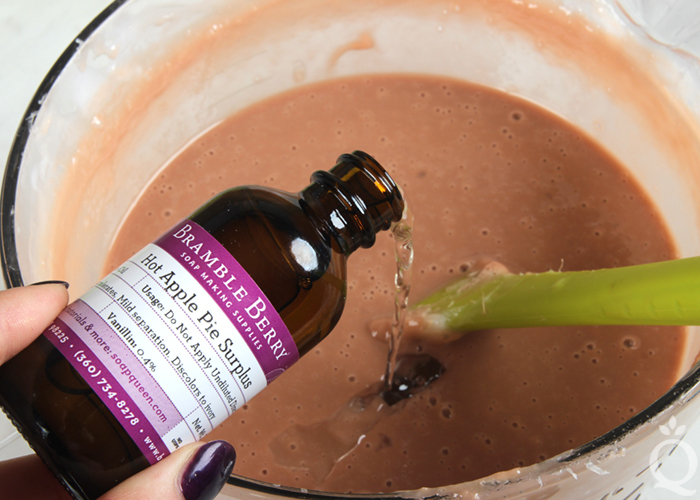 The new version is made with delicious Hot Apple Pie Fragrance Oil. Flexy Fast Molding Putty is the key to getting the realistic shape. 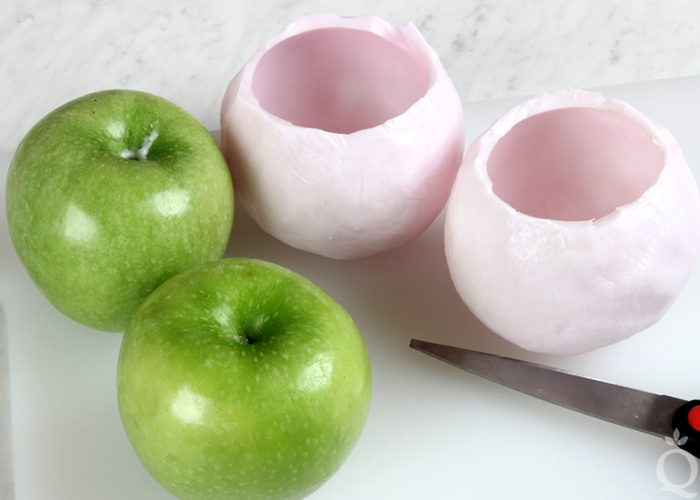 It’s easy to use – just combine the pink and white components and mold it over an apple. Once it’s set, you have a silicone mold you can pour your caramel soap in and then reuse for future projects. The bars are finished with more caramel soap and a sprinkle of Dead Sea salt. 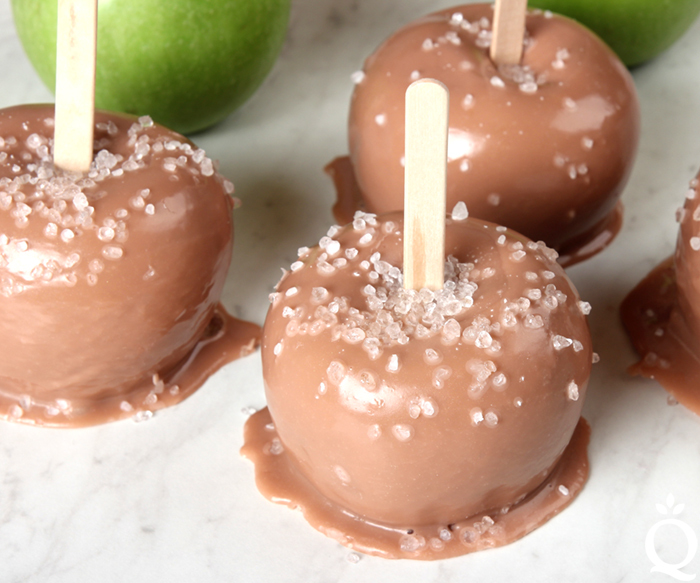 They’re the perfect way to celebrate fall. The exact amount of soap you need depends on how many apple molds you create and how large they are. If you only want to make 1-2 apple molds, the trial size of Flexy Fast Molding Putty will do the trick. If you’d like to make more at one time, we recommend the full size. This provides enough putty for several apples with plenty leftover. Learn more about working with it in this Soap Queen TV video. ONE: Flexy Fast Molding Putty comes as two parts, Part A and Part B. The usage rate is 1:6 (B:A) by weight or 1:20 (B:A) by volume. If mixing by volume, a good rule of thumb is about a golf ball size of the white stuff (Part A) to a marble size of the pink stuff (Part B). With vinyl gloves on, quickly knead the two components together until fully incorporated. Use as much as you’d like depending on how many molds you’d like to make. You’re done when you have a nice bubblegum color with no pink streaks, which will take about 1 minute. 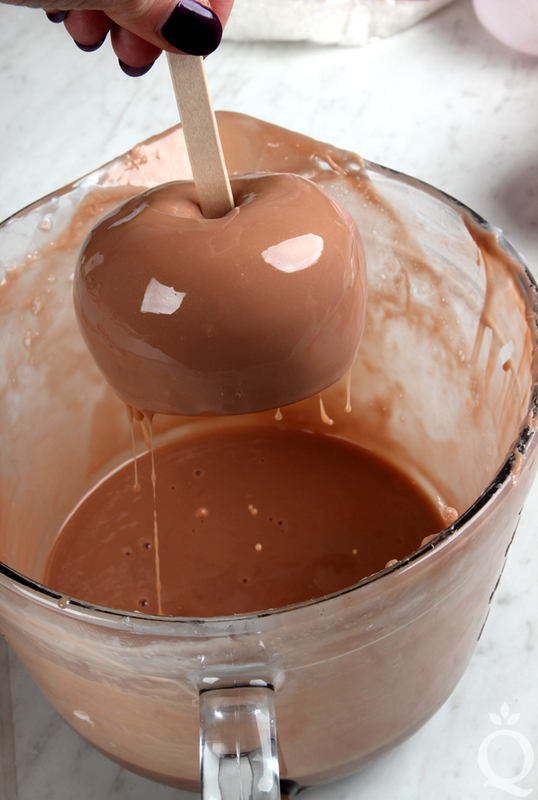 TWO: Once the putty is mixed, quickly cover the apples. Really press the putty into the apple to ensure that you get all of the realistic details and to release any air bubbles. Keep in mind where the top and bottom of the apple is and leave a small hole at the bottom of the apple. This will become the top of the mold. Continue this process with as many apples as you’re making. TIP: We found a thin mold was more flexible when later removing the apples, so don’t apply the putty too thick. The putty shown below is actually a little on the thick side. THREE: Once the apples are covered, allow the putty to fully harden. This takes about an hour or up to several hours. Once the putty is firm, flexible, and pulls away from the apples, use scissors to cut the hole large enough to push the apple through. If it’s not large enough, the mold could tear. If this happens, you can super glue it back together (this happened to one of our molds, but it turned out okay). Carefully push the apple out of the mold. The top of the apple will become the bottom of the mold. Set molds aside while you prepare the soap. FOUR: Cut 16 ounces of White Melt & Pour Soap Base into small even pieces. Then, chop 32 ounces of Clear Melt & Pour Soap Base into small even pieces. 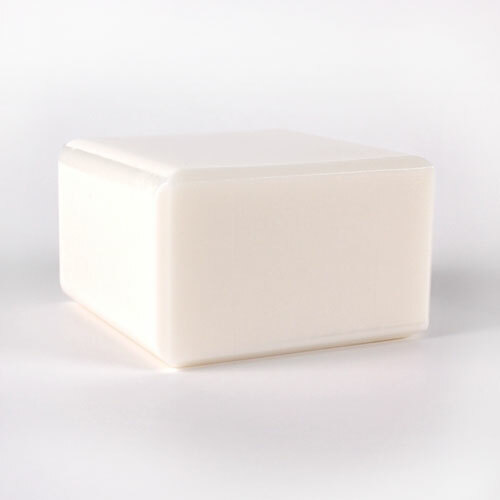 If you’re making a smaller batch, use the same ratio of 1 part White Soap Base to 2 parts Clear Soap Base. This gives the soap an opaque look without being too light. You need enough soap to make the apples and the “caramel dip” later. In this case, having extra soap is better than not having enough. FIVE: Place the soap in a large heat-safe container and melt using 30 second bursts. Stir in between each burst to help evenly melt the soap. Then, begin adding drops of the Liquid Yellow Colorant and the Liquid Brown Iron Oxide Colorant until you get a caramel color. Begin adding them in equal parts, then add more yellow or brown colorant to adjust the color as you see fit. Then, add a dash of Gold Sparkle Mica. For this large batch, we used 1/4 teaspoon. Stir in the colorants thoroughly. SIX: Stir in the Hot Apple Pie Fragrance Oil. Then, carefully pour the soap into your apple molds. Spritz with alcohol to help get rid of bubbles. Set the remaining soap aside. It will become the “caramel dip” later. SEVEN: Allow the soap to cool in the mold for about 30 minutes, then check on it. Once the soap is hard enough to remove but is still warm, carefully remove from the mold and push the craft sticks into the center of the apple on the top. The soap needs to be removed from the mold while still slightly warm in order to push the craft sticks in. EIGHT: Reheat the caramel colored soap in the microwave using 30 second bursts. Once it’s completely melted and around 135-140F, dunk each soap apple into the melted soap. Twirl it around and move the bowl around if necessary to fully cover the apple. Lift the apple up and out of the soap, and place onto a piece of wax or parchment paper. 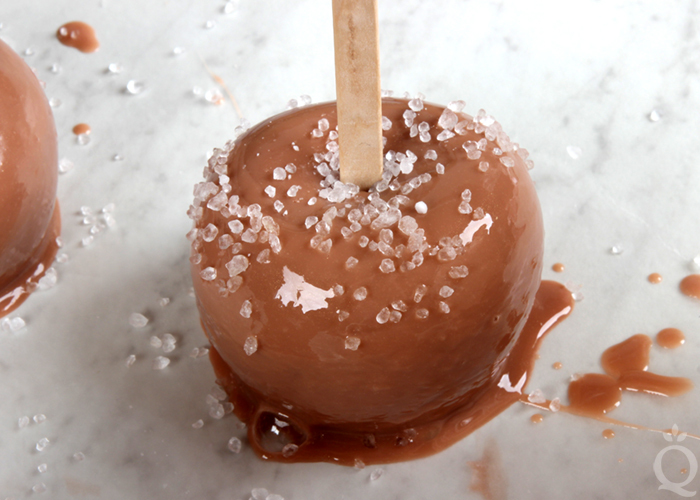 NINE: Very quickly sprinkle the Dead Sea salt onto the apple and spritz with alcohol to help get rid of bubbles. Repeat until your soap is gone, and pour any extra soap into a different mold. Allow the soap to fully cool and harden, then enjoy! Once you’re ready to use this soap, we have found cutting it into pieces works best. 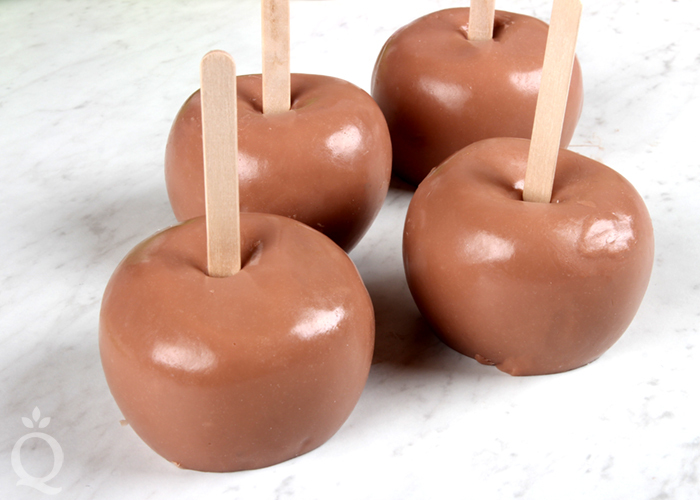 These DIY Caramel Apple Soaps are the perfect way to celebrate fall. Flexy Fast Molding Putty comes as two parts, Part A and Part B. The usage rate is 1:6 (B:A) by weight or 1:20 (B:A) by volume. If mixing by volume, a good rule of thumb is about a golf ball size of the white stuff (Part A) to a marble size of the pink stuff (Part B). With vinyl gloves on, quickly knead the two components together until fully incorporated. Use as much as you’d like depending on how many molds you’d like to make. You’re done when you have a nice bubblegum color with no pink streaks, which will take about 1 minute. Once the putty is mixed, quickly cover the apples. Really press the putty into the apple to ensure that you get all of the realistic details and to release any air bubbles. Keep in mind where the top and bottom of the apple is and leave a small hole at the bottom of the apple. This will become the top of the mold. Continue this process with as many apples as you’re making. 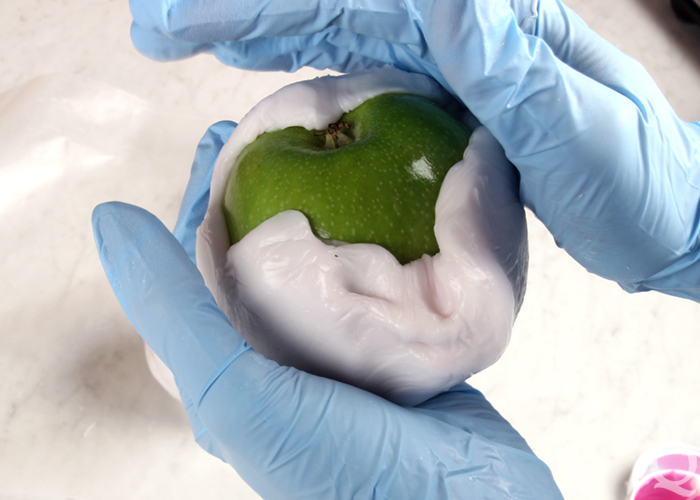 TIP: We found a thin mold was more flexible when later removing the apples, so don’t apply the putty too thick. Once the apples are covered, allow the putty to fully harden. This takes about an hour or up to several hours. Once the putty is firm, flexible, and pulls away from the apples, use scissors to cut the hole large enough to push the apple through. If it’s not large enough, the mold could tear. If this happens, you can super glue it back together (this happened to one of our molds, but it turned out okay). Carefully push the apple out of the mold. The top of the apple will become the bottom of the mold. Set molds aside while you prepare the soap. Cut 16 ounces of White Melt & Pour Soap Base into small even pieces. Then, chop 32 ounces of Clear Melt & Pour Soap Base into small even pieces. 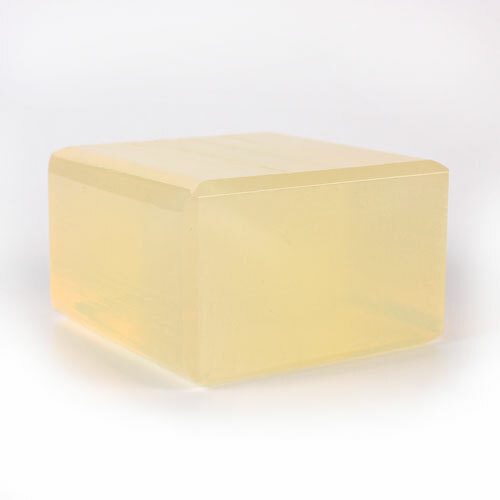 If you’re making a smaller batch, use the same ratio of 1 part White Soap Base to 2 parts Clear Soap Base. This gives the soap an opaque look without being too light. 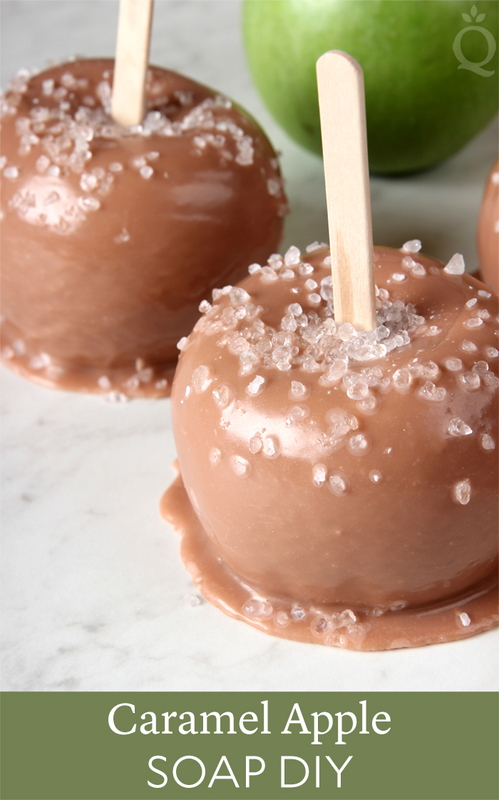 You need enough soap to make the apples and the “caramel dip” later. In this case, having extra soap is better than not having enough. 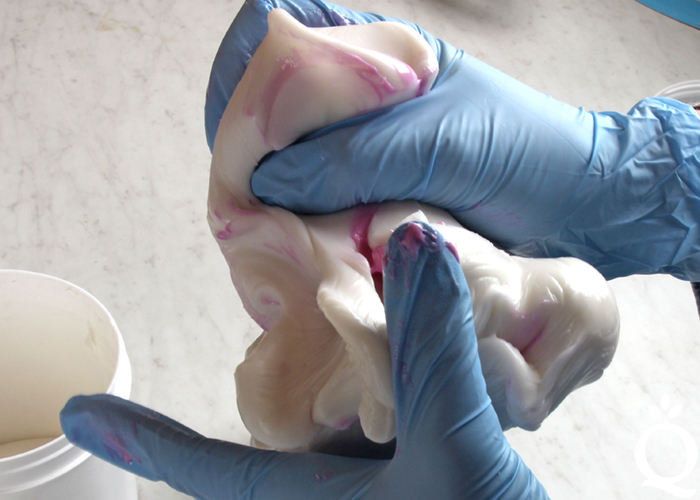 Place the soap in a large heat-safe container and melt using 30 second bursts. Stir in between each burst to help evenly melt the soap. 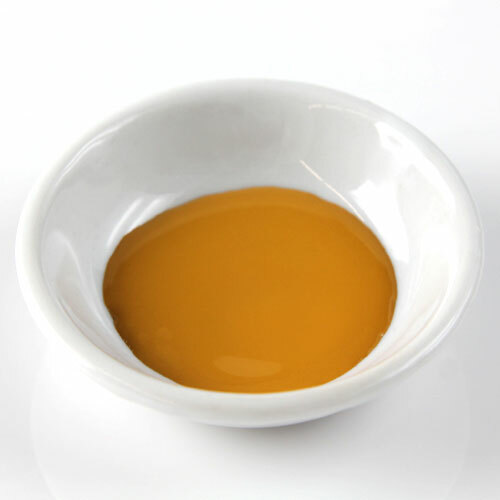 Then, begin adding drops of the Liquid Yellow Colorant and the Liquid Brown Iron Oxide Colorant until you get a caramel color. Begin adding them in equal parts, then add more yellow or brown colorant to adjust the color as you see fit. 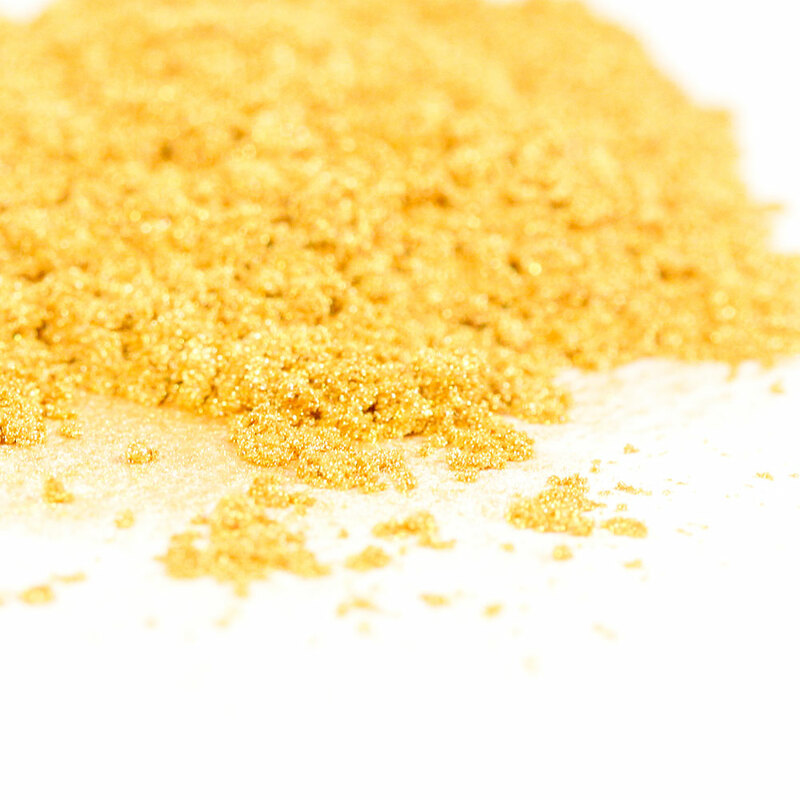 Then, add a dash of Gold Sparkle Mica. For this large batch, we used ¼ teaspoon. Stir in the colorants thoroughly. 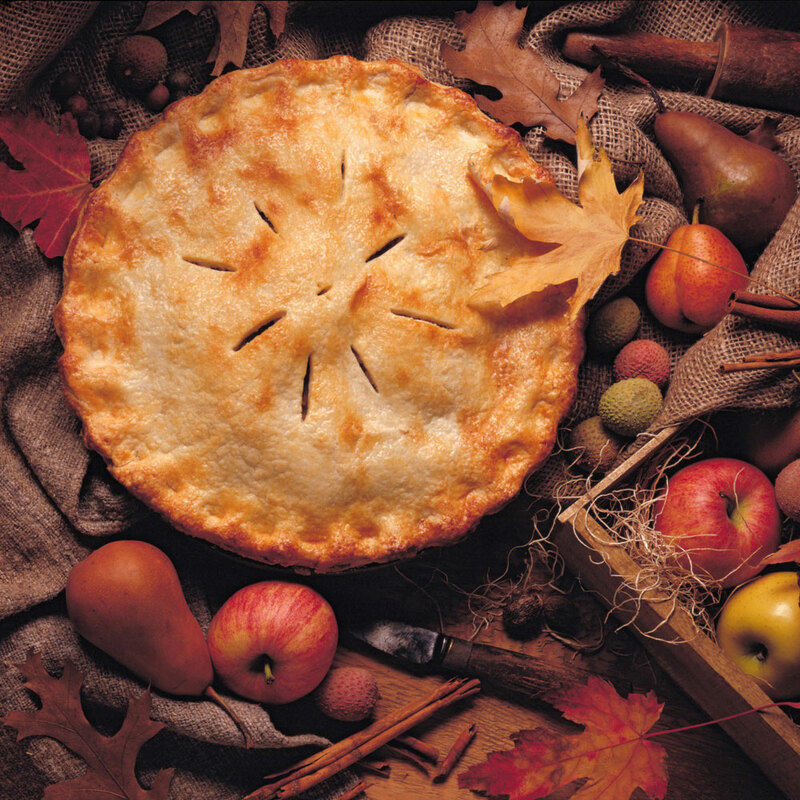 Stir in the Hot Apple Pie Fragrance Oil. Then, carefully pour the soap into your apple molds. Spritz with alcohol to help get rid of bubbles. Set the remaining soap aside. It will become the “caramel dip” later. Allow the soap to cool in the mold for about 30 minutes, then check on it. Once the soap is hard enough to remove but is still warm, carefully remove from the mold and push the craft sticks into the center of the apple on the top. The soap needs to be removed from the mold while still slightly warm in order to push the craft sticks in. Reheat the caramel colored soap in the microwave using 30 second bursts. Once it’s completely melted and around 135-140F, dunk each soap apple into the melted soap. Twirl it around and move the bowl around if necessary to fully cover the apple. Lift the apple up and out of the soap, and place onto a piece of wax or parchment paper. 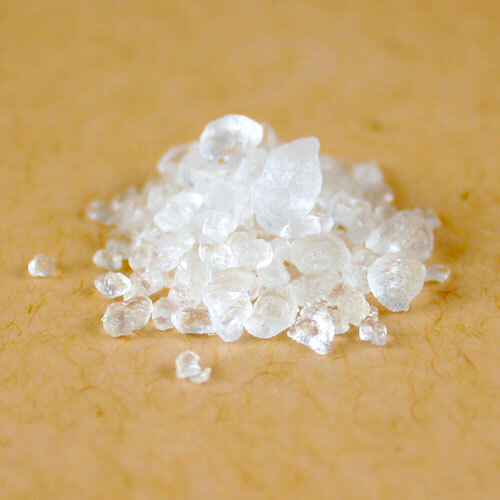 Very quickly sprinkle the Dead Sea salt onto the apple and spritz with alcohol to help get rid of bubbles. Repeat until your soap is gone, and pour any extra soap into a different mold. Allow the soap to fully cool and harden, then enjoy! Once you’re ready to use this soap, we have found cutting it into pieces works best. 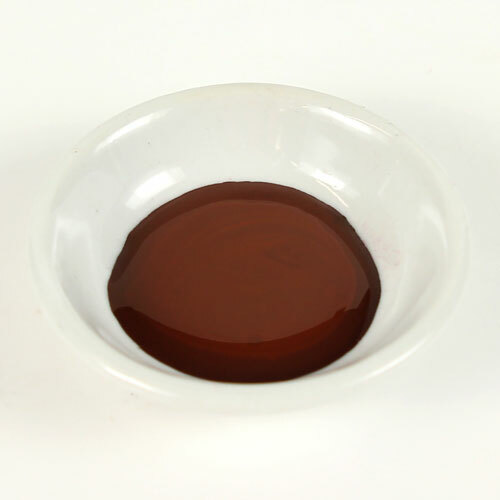 Brambleberry no longer offers the liquid brown iron oxide colorant. Now what? Where do we get the flexy putty now? I noticed itis discontinued. We don’t offer the Flexy Fast Molding Putty anymore. The closest product we carry is the Pourable Silicone which can also be used to create molds. I made these a few days ago and used the epson salt after the final dipping. It looked cute for about two days then the salt kinda melted and left pot marks where they were and now they look pretty gross! What did I do wrong? I wish I never used the salt! I can easily understand how this happened to you. I have melt and pour soap that has salt in the top layer of the bars(not even sprinkled on the very top). It was bagged and shrink wrapped immediately after unmolding and after about a week it did the same thing as what you are talking about. Even though it is purely cosmetic it completely ruined the look of the soap and no one will buy it. A shame because it contains seaweed along with the salt and lathers wonderfully! Nancy, the salt melted into the soap even when it was shrink wrapped? Yes Ma’am. In my recipe the salt was just below the surface of the soap but it still “bloomed” into these white spots that were soft and squishy to the touch. We do live in a humid environment here so that could have something to do with it, I’m not sure. 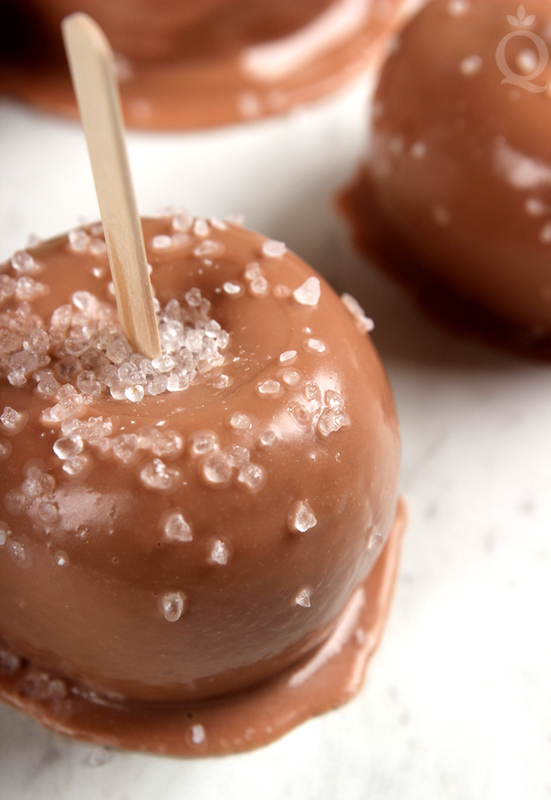 I think I will try the caramel apple recipe with rock sugar instead of salt. 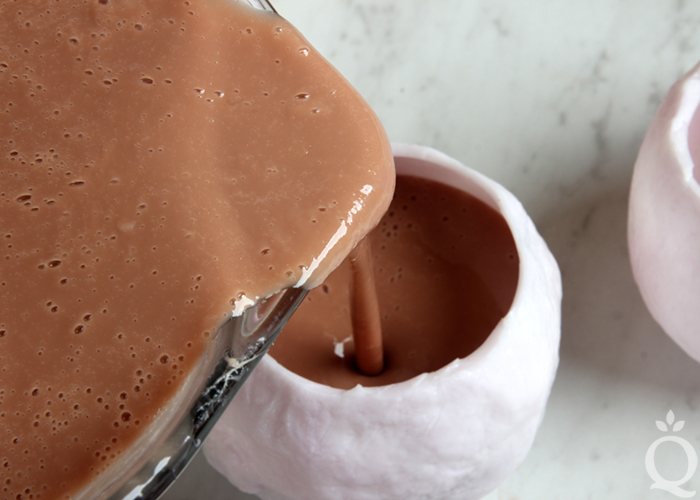 You can also melt some soap, color it brown, and drizzle it on to look like chocolate. Another option is to make soap embeds that look like nuts, that would be cute. Would this work with CP soap? Yes, you can do this with cold process soap. There will be a few tricky parts – you want to unmold the soap when it’s still soft so you can put the craft stick in. If you unmold cold process when it’s still soft, you can get drag marks. Just keep checking the soap and testing the stick to see when it’s ready. You’ll also need to make a second batch to dip the soap in – thin trace soap will give you that caramel texture. These are adorable, I would love to try this with CP soap too! I now make all my embeds with CP soap instead of MP (and also use some silicone mold like this one for individual soaps). I find that if I wait 1 week with the soap in the mold, then put it in the freezer for 24 hours, I can easily unmold it. I think that would work well with this too. After the soap unfreezes, it is soft like 2 day old CP, so you should be able to easily put the stick in. I would pour CP soap on top too (don’t know if that will work as well as MP, but I think it should). They look good enough to eat! So clever using real apples to make the moulds! Thanks Liz! They smell great too, it was making us crave a real caramel apple. Such an Awesome & Cute recipe! Can’t wait to try this out!